Warning – this post contains no actual climbing! We decided to spend a rest day getting a bit of the drive north done and recceing the crags around Vingrau. 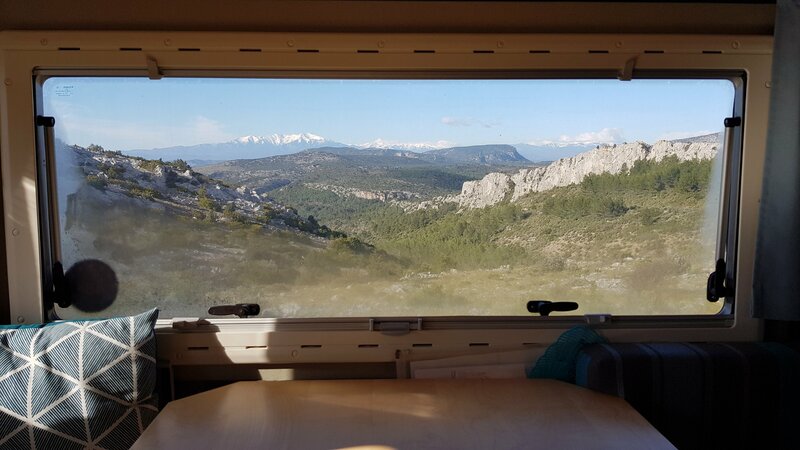 This area, just over the border into France, and confusingly in a region they call Catalan, is another that’s been on our radar to explore for 30 years having appeared in the original “Sun Rock” guidebook. We’d come close to a visit a couple of years ago, but read about a number of crag closures so changed plans. 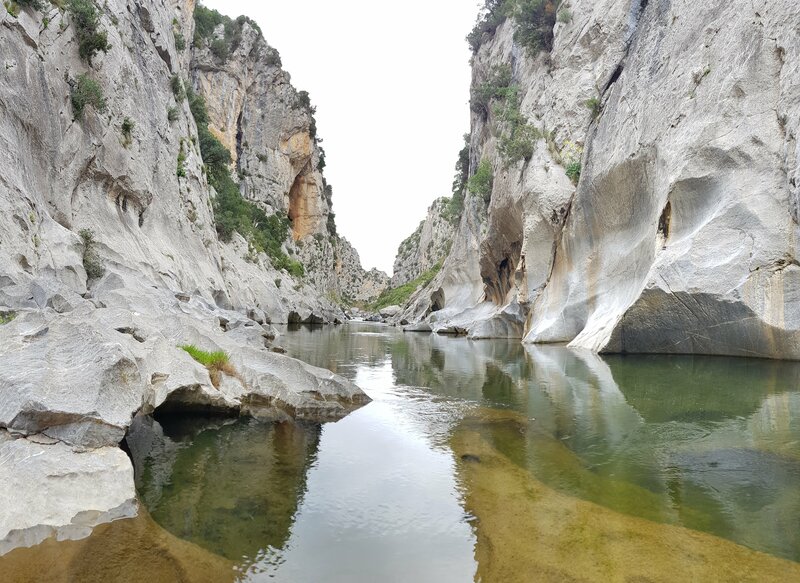 The sector Gouleyrous is a lovely spot, set either side of the river as it has cut its way through the limestone to form a natural gorge. Great swimming spot (though this is banned) and the routes I managed to identify looked to be mostly 4s and 5s on well bolted slabs. 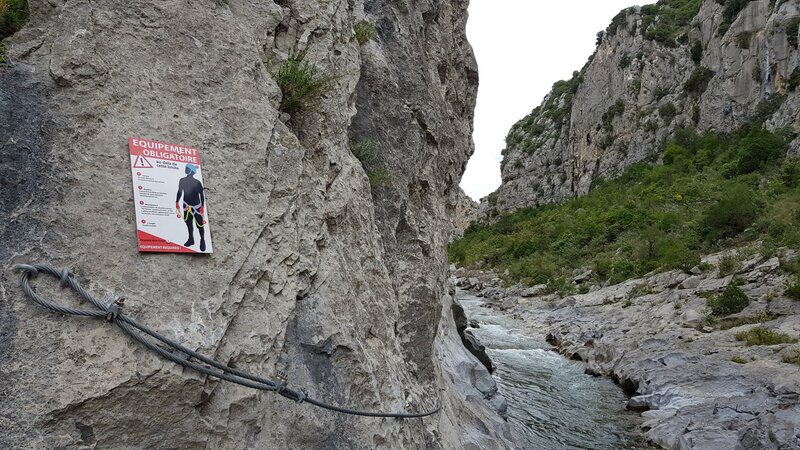 There’s a fun bit of cable / via ferrata to access the upper gorge and probably more of the routes (the topo has quite a range of grades). The other side of the village there are a bunch more sectors including L’Alentou which looks to be easily accessed from the road. 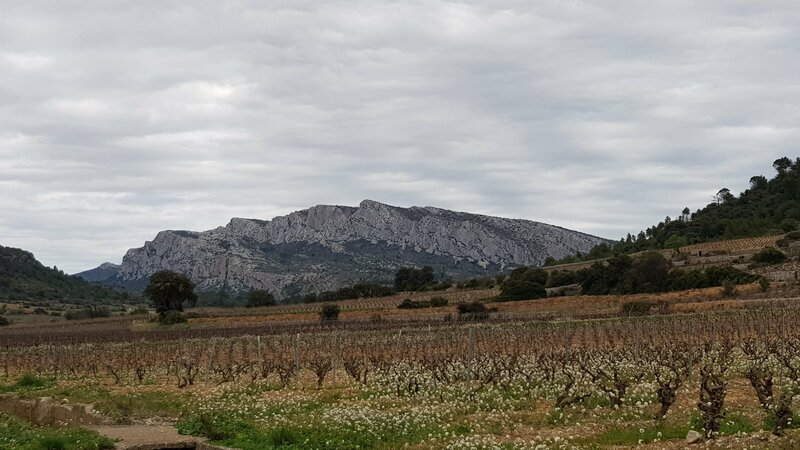 Looking north from Tauteval, the crags of Vingrau are clearly visible as a long limestone ridge running for a couple of kilometres, dominating the far skyline. 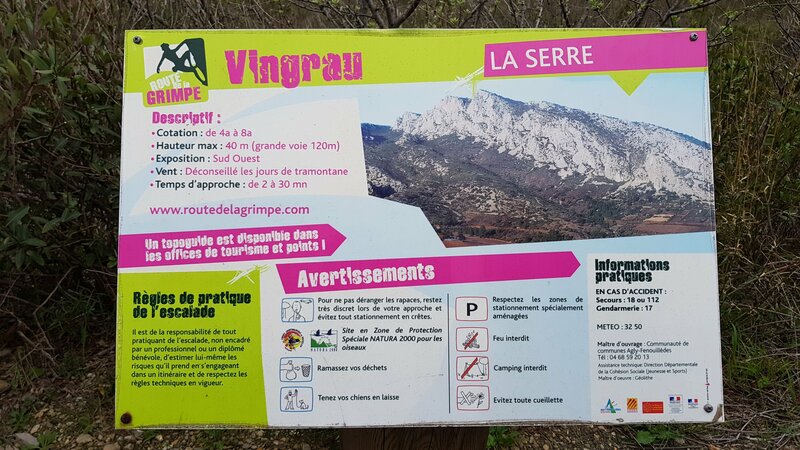 One end of this abuts the D9 and there’s a dedicated parking area to access the climbing at N42.8520856, E2.7933598 From here it’s a 2 minute walk up to the nearest routes (a preponderance of grey slabs I’m afraid, and we couldn’t find a guidebook though there’s a suggestion that you could pick up a topo at the tourismo in the village). Reassuringly, there are signs promoting the climbing at a number of the car parks, rather than detailing bans! 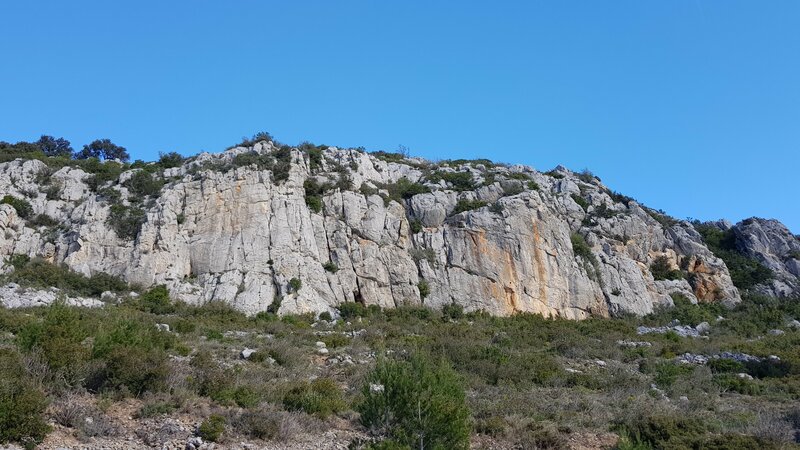 Heading over to Opoul we found a couple of very attractive crags. 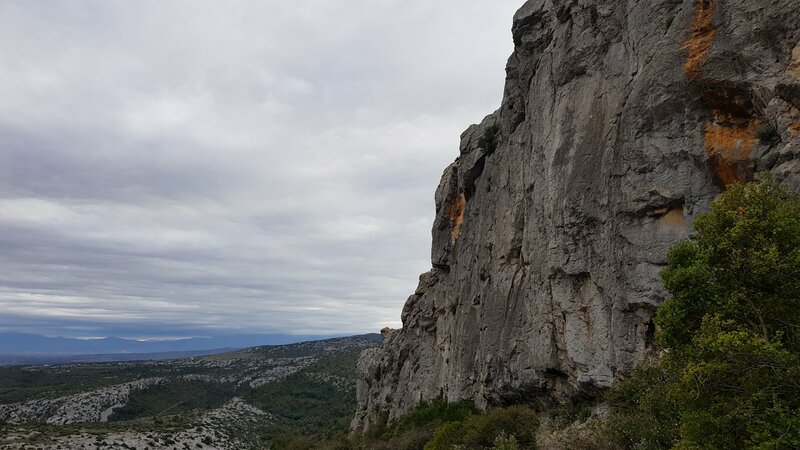 Les Abeilles is a long crag with about 50 routes from 4c to 7a mostly 5s and 6s, up to 30m high and a 5 minute downhill walk from a handy parking area. 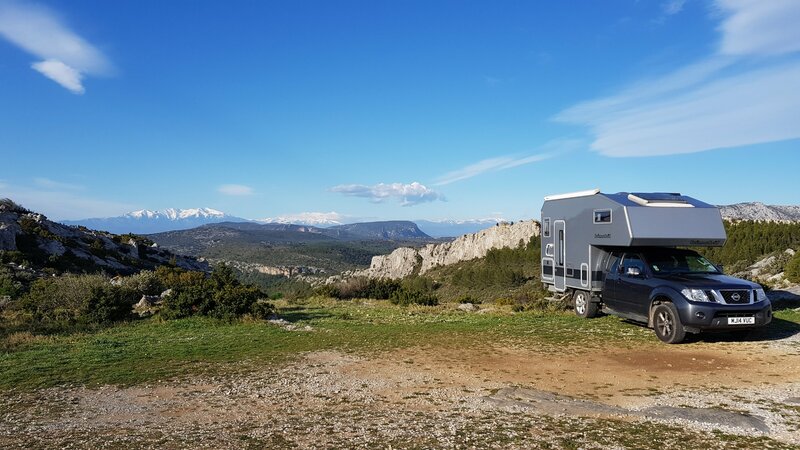 This is a great overnight spot which gave fantastic views over the crag and the Pyrenees (now to the south!) in the morning. There’s a topo here http://deversud.com/telechargements/fichiers/1490871814.topo.les.abeilles.opoul.pdf We didn’t climb there but did go for an inspection, and the climbing looked well worth a try sometime. There you go – that should at least get you started and I reckon you could happily spend a week in the area. Enjoy!